What is the closest many University of California, Santa Barbara students have ever come to losing their limbs? A bike or skateboard accident? A near fall off the flight of stairs connecting Del Playa Drive and the beach? Remember the last time you injured yourself and thought it was the end of the world knowing you would be greeted with a hard time writing, walking, or scratching your back? For Nick Vujicic, living a life without limbs has been his whole life. The Australian Christian evangelist made a visit to the Corwin Pavilion on Tuesday, sparking a huge turnout from students, staff, faculty, and community members to the point where the organizer had to turn away up to 100 guests. At 7 p.m. sharp, Vujicic made his appearance on our stage alongside a huge round of applause from the crowd of approximately 500 people and the Revelation Song, performed by the IV Worship. He greeted the crowd with a friendly Australian accent. Chris Comstock, the campus director for Christian organization CRU at UCSB, said his first impression of Vujicic was “definitely his confidence and authenticity … he was so free in himself.” Vujicic stood on the stage without showing a bit of shame due to his lack of limbs for the entirety of the evening. As the evening progressed, the crowd was drawn by Vujicic’s story about his early years, from being bullied in school to starting his relationship with Jesus Christ at the age of 15, to later traveling around the world and giving speeches in 68 countries to audiences ranging from government officials to people with disabilities. 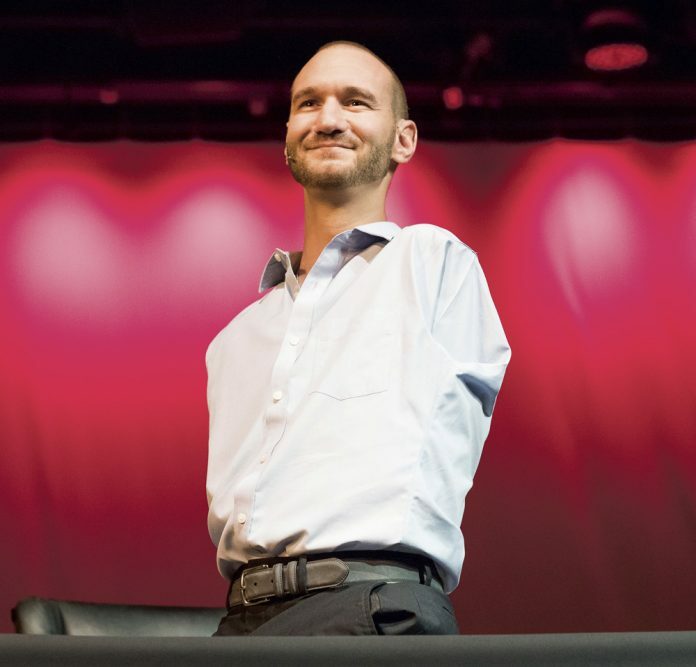 “No one is ever going to love me,” Vujicic recounted thinking in his past. He feared to be lonely for the rest of his life, thought about committing suicide, and questioned the point of living. Today, he is happily married with 2 kids, has “[Given his] life to Jesus Christ,” traveled around the world, and hugged many people in different countries facing different problems. “[Vujicic] seems to love people a lot..he wants to interact with people through hugging”, said Comstock. In fact, hugging people is Vujicic’s signature move in all his talks. Through having a close interaction with his audience, Vujicic hopes everyone can feel the power of Jesus Christ and His spirit in humanity. “There’s hope that only God can offer [which] will last forever, and doesn’t fail you even in the worst of circumstances,” Comstock, who helped organize the event, said. Vujicic’s appearance reassured Comstock’s belief in Jesus Christ. For some attendees, they found themselves in quite an emotional spot. Sandra Shupp, a fourth year economics and accounting major, recalled the time when she struggled for motivation to wake up every day. To Shupp and Jael Tringade, a third year religious studies and English double major, their most memorable moment of the evening happened when Vujicic invited his audience to find their hopes and satisfaction in life that will always give us fulfillment. “There were many things that I took away from Vujicic, but above all, God loves all of us no matter who we are,” said Tringade. Those at Vujicic’s speech learned a key lesson: after all, it is not merely about our religion, what we have, or what we don’t have. It’s about believing in what we pursue and having faith in the path we walk down. “Don’t be surprised if when you seek happiness in temporary things, your happiness is just temporary,” said Vujicic, leading up to the discussion of this relationship with Jesus Christ. He reminded his audience that fulfillment in temporary things, such as fame, status, success, and pleasure will fade quickly. Injuring ourselves in whatever circumstances does not equate with the end of the world; neither does not being able to scratch our backs. Whatever happens to us could be an inspiration to other people to do better, to wake up every day, and to face their problems with a positive attitude, like in Vujicic’s world.